Specimen plant. 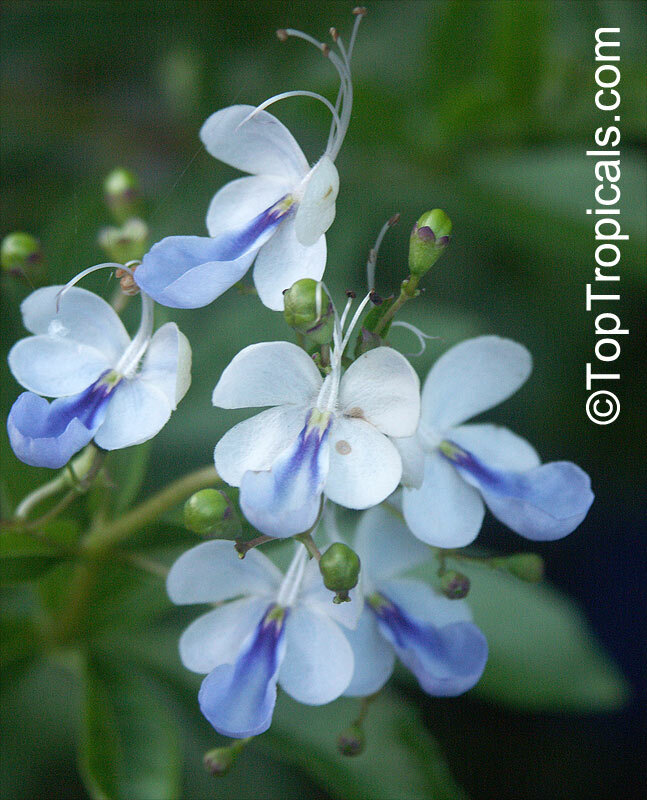 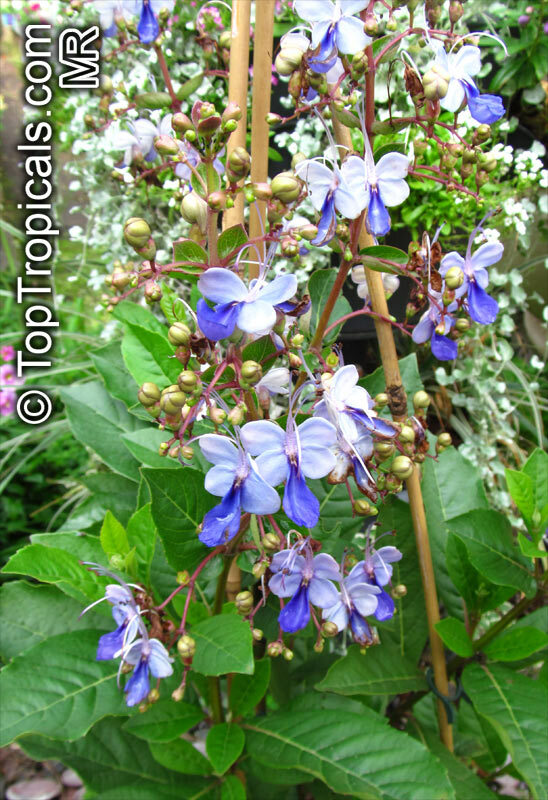 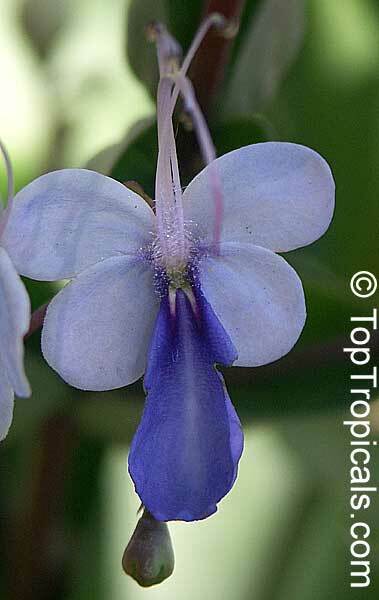 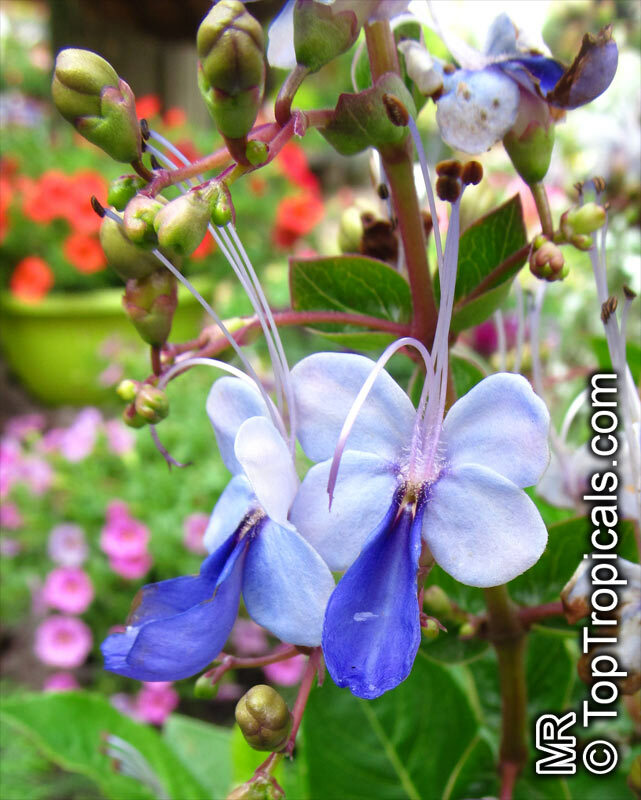 Sky blue flowers looking like butterflies - unusual color for tropics. Clerodendrum ugandense has been cultivated in botanical gardens for almost 100 years, but has only recently been considered as flowering potplant. 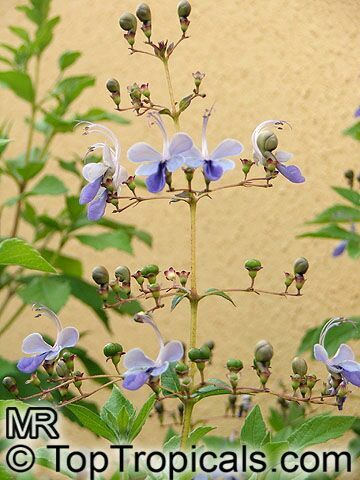 It is a fast growing plant which in nature grows to 6-9 ft, but is easily kept much smaller. 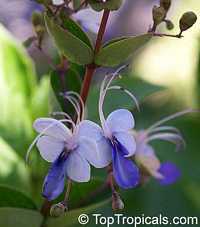 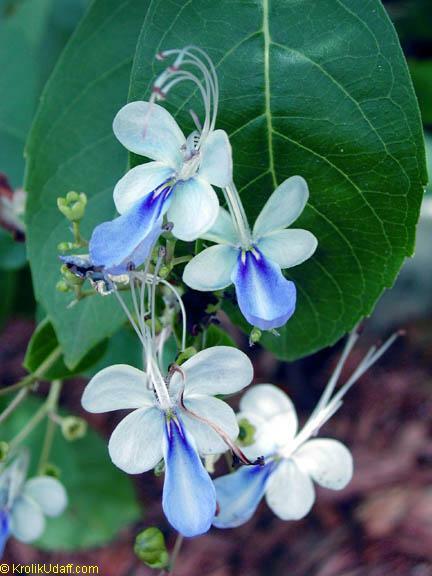 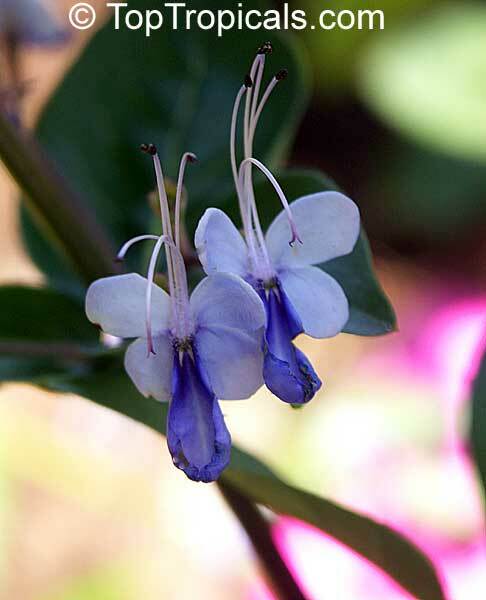 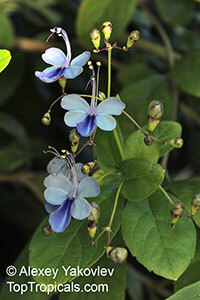 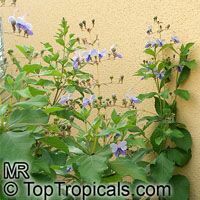 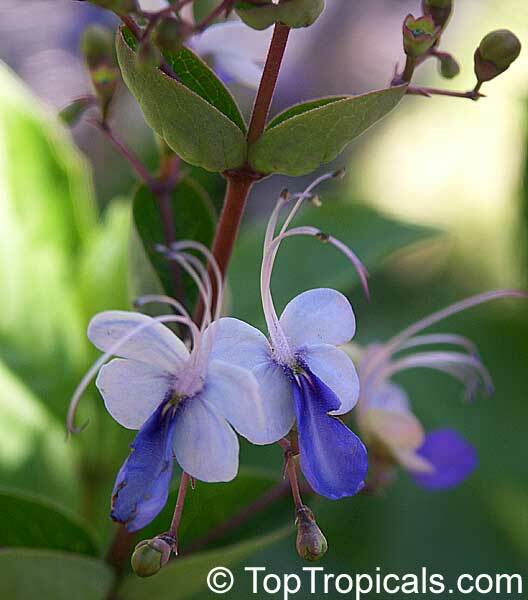 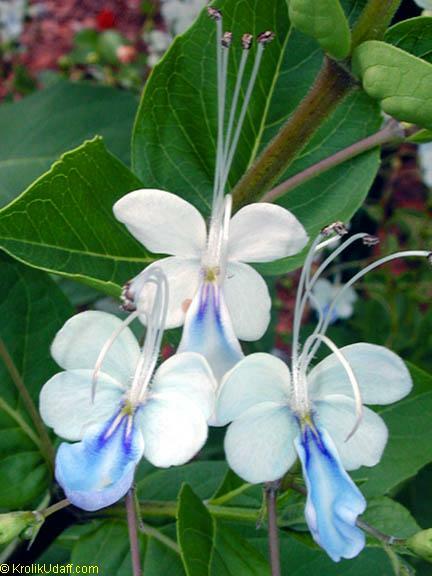 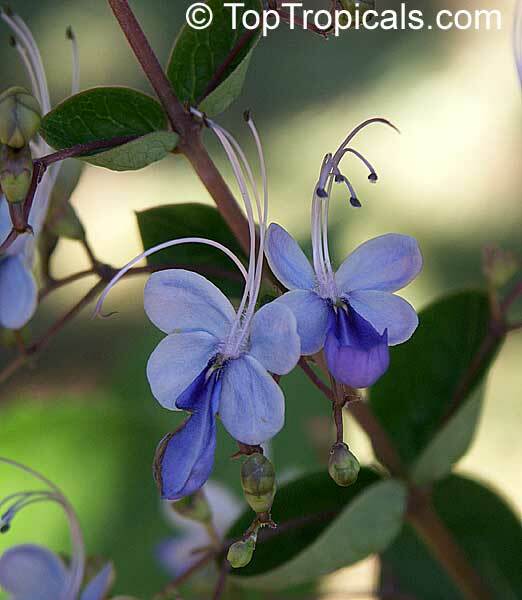 The irregular flowers are bright blue, in two different shades of blue and are produced more or less continuously throughout the summer and fall. 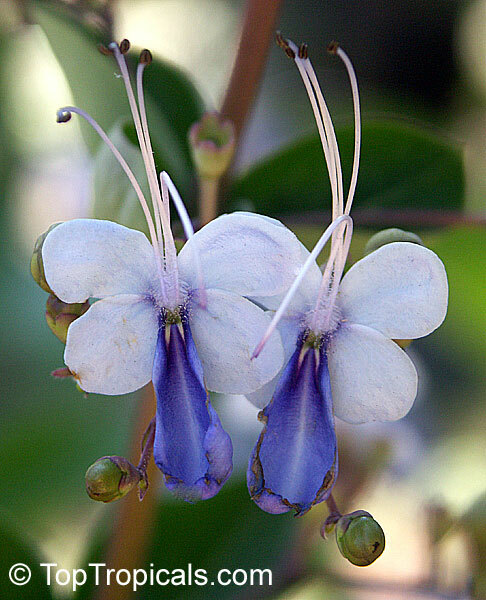 Flowers have long purple anthers which bend elegantly upwards. 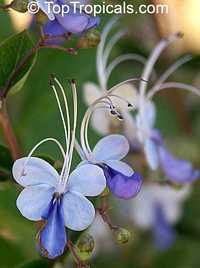 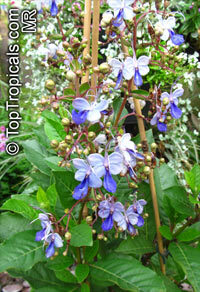 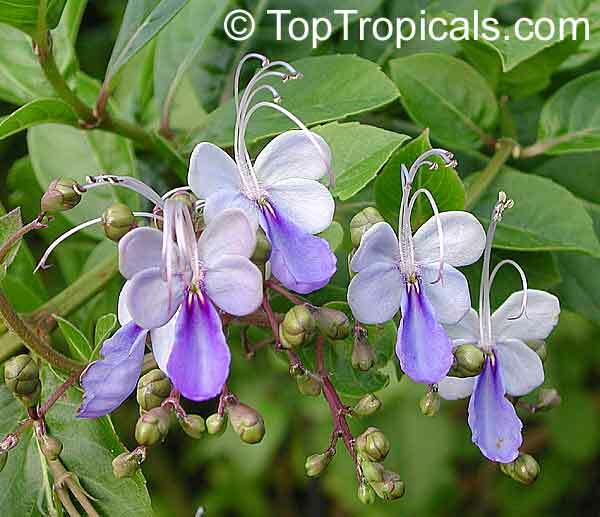 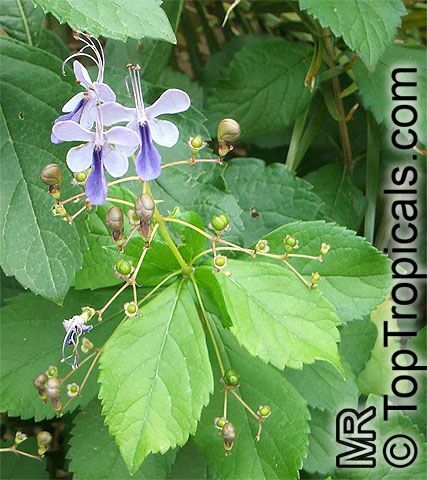 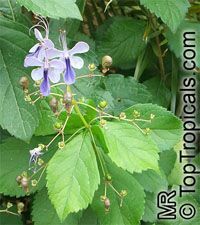 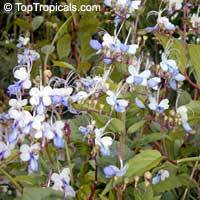 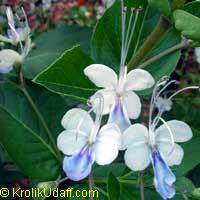 Grow this clerodendrum in partial shade. 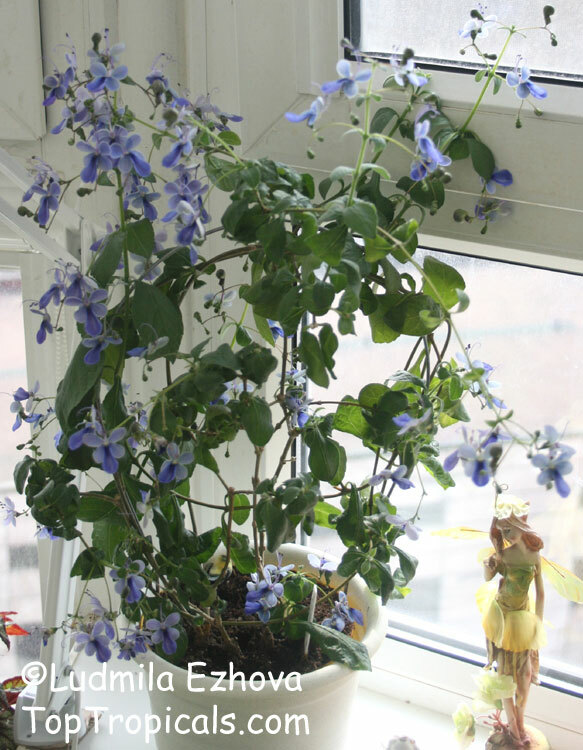 Water freely in growth but reduce watering in winter. 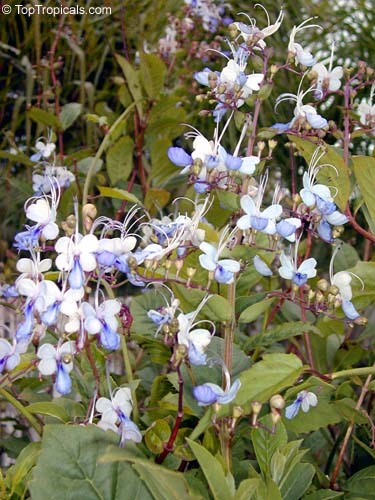 Hardiness: USDA Zones 10 - 11. 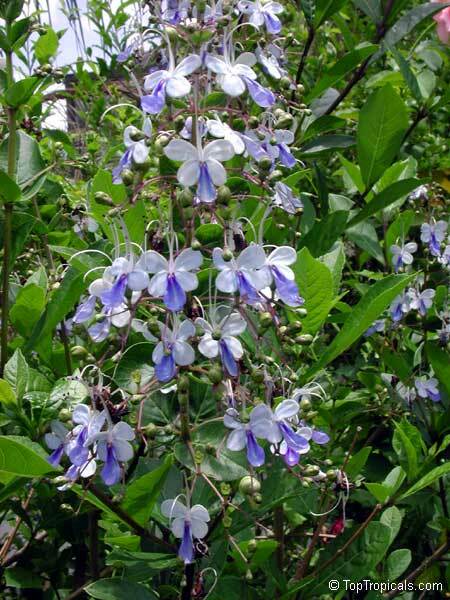 Performs best in a frostfree climate, but it is root hardy in zones 8 and 9, freezing to the ground in winter, but returning from its roots in spring. 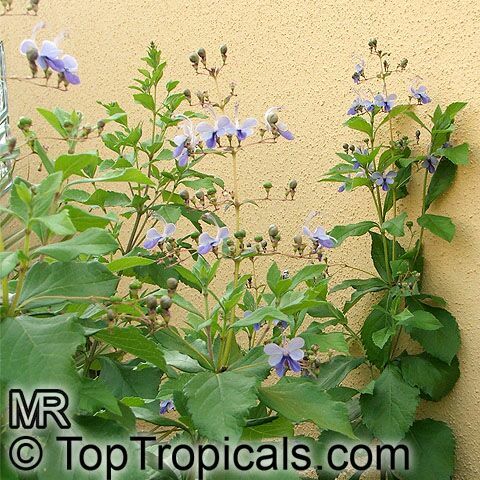 Prune back as needed to keep it in bushy shape. Cut back the old wood to a pair of buds to improve flowering. 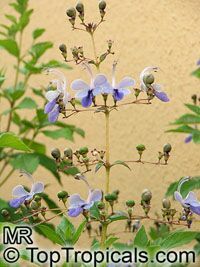 In areas that get frost, you can get the most consistent flowering by growing it in a large pot that can be brought indoors when temperatures approach freezing. 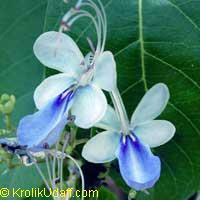 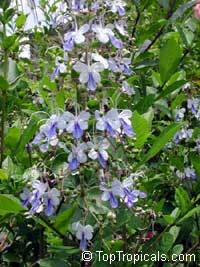 It has an odd scent when the leaves are brushed which may serve to repel chewing insects because it is pest free.